For many, a family is where you turn to for love and support. What if your family is currently living with the effects of an alcohol or drug addicted loved one? The disease model of addiction and research dismisses the question of morality. It explains the issue from a neurological, genetic, biological, and social standpoint. As a complex chronic disease, addiction leaves an individual afflicted with no control. It removes any and all defense against his or her substance use. Alcoholism and drug addiction hi-jacks the brain, making significant changes to its chemical structure and function. As a result, any psychological changes that take place do last a lifetime. The disease is ruthless, leaving family members of those who are addicted to despair. Loving an addict feels powerless and even hopeless at times. Although it’s not always noticed, amongst family roles in addiction, each family member plays his or her part. 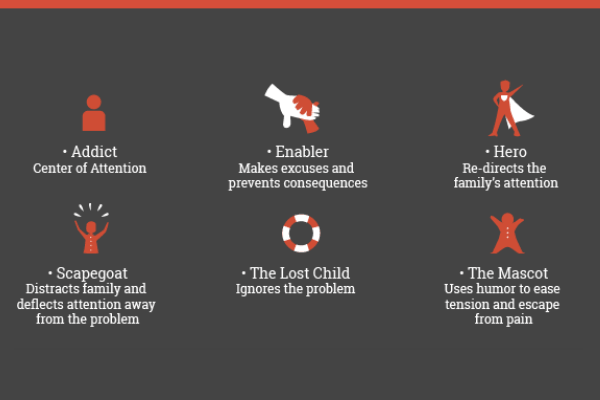 Roles in an addicted family often contribute to the progression of the problem. Understanding its nature is the first step for a family trying to overcome this exhausting and life-threatening disease. The bottom line is – addiction is a disease that is isolating and silencing to those who are living with it. The disease fuels the compulsion to drink and use drugs as a way of instinct and survival. The process of recovery is complicated and only overcome with proper knowledge and resources. Substance misuse will lead to addiction, which affects everyone in the family. From children of addicts to children of alcoholics, addiction won’t fail to hurt all those around the sufferer. 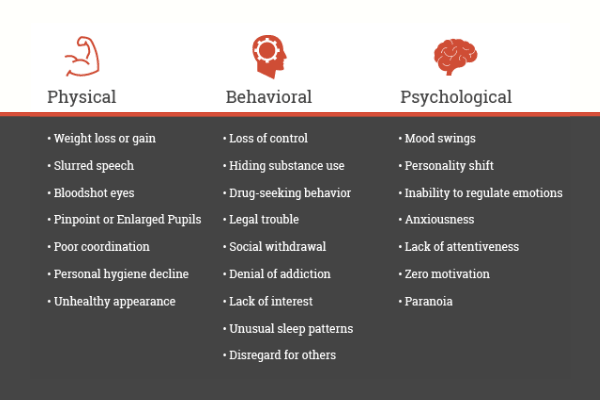 Signs and symptoms of substance use often go unnoticed for a significant amount of time. If you have any reason to believe a loved one is using drugs or alcohol, don’t write it off – act. Feeling as though a loved one is abusing substances and could be addicted is unsettling – to say the least. 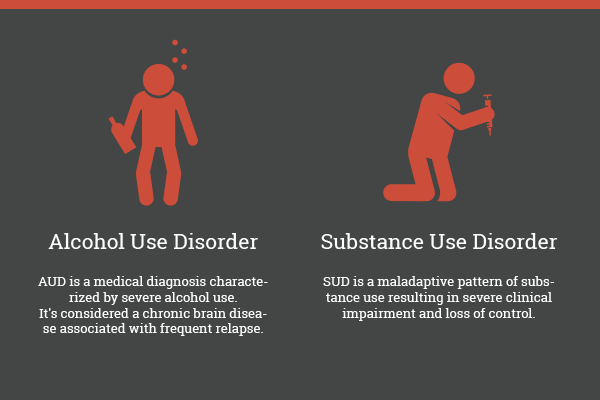 One of the central signs of an individual with substance use disorder is continual use regardless of the psychological, mental, and physical pain it inflicts on his or her life. There are many behaviors and non-verbal cues that can point to alcohol and drug abuse. If your loved one is showing signs of substance abuse, you may need to seek outside help. When someone you love is abusing drugs or alcohol; preventative measure should be taken. Stopping the development or progression of addiction is imperative to the health and life of your loved one. When it comes to substance abuse – when does recreational use of drugs and alcohol become an addiction? Substance abuse often causes chemical dependency. In the realm of addiction medicine, drug dependence is known as, Substance Use Disorder, SUD. Similarly, the correct medical term for dependence on alcohol is Alcohol Use Disorder, AUD. According to SAMHSA, there is a profound impact on individuals when generations of substance abuse exist in the family or community. Guides and definitions of SUD and AUD are locatable in the 5th Edition of the Diagnostic and Statistical Manual of Mental Disorders, DSM-5. Substance abuse throughout generations has a negative effect on the overall well-being and dynamics of a family. Addiction is a psychological disorder that alters the brain. Brain changes leave the user without choice after the first decision to drink or use drugs. Although addiction can happen to anyone, at any stage in life, some individuals are at greater risk. The National Council on Alcoholism and Drug Dependence (NCADD), reports that both a person’s environment and genetic disposition contribute to the onset of drug and alcohol addiction. A publication based on Addiction science & clinical practice states an estimated 50 percent of cases of substance abuse leading to addiction is hereditary – in other words genetic. The Genetics of Alcoholism covers information you need to know about addiction and its link to heritage. When a loved one is abusing substances, it’s common for them to isolate from the rest of the family. This happens because it’s typically preferred to associate with others who are active in abuse of the substances as well. Unfortunately, family roles in addiction are played by everyone and overtime the substance abuse will only become more injurious. Addiction hurts the person using the substances as well as his or her entire family. Addiction passes down from earlier generations and the weight and detriment on families is heartbreaking and unmanageable. A person’s immediate family, as well as the extended family members, feel the impact of alcoholism and addiction. SAMHSA’s TIP states that an addicts extended family members often experience feeling a sense of anxiety, fear, concern, abandonment, embarrassment anger, and even guilt. Research on children of alcoholics determined that life-altering and detrimental effects are a result of by parental alcohol abuse. Data suggest that when children of alcoholics come from unstable households, they tend to suffer from psychological and social issues throughout life. Comparatively, children of addicts live with various emotional, mental, and legal problems. During childhood, family systems play a significant role in the young ones healthy or unhealthy psychological development. Across the board – emotional, physical, and mental health status of family members decline dramatically in the face of addiction. Whether the addict is a child, teenager, or adult, parents of addicted loved ones experience a significant amount of pain and confusion. Parents of addicts often feel helpless and gradually lose hope for a better day to come. SAMHSA substance abuse treatment and family therapy state, ‘if a child or adolescent abuses substances, any household can experience conflict and continual crisis.’ Moreover, emphasizing that for many families that have a substance abusing adolescent, one parent in the household also abuses substances. Most families don’t realize the fundamental part that they play in a loved one’s progression of substance abuse, addiction, and recovery. Obviously – there is a reason that addiction is known as a disease of the family. Addiction is a family disease because it causes instability, emotional uproar, and a crisis in a home. When someone is addicted to alcohol or other drugs, the entire family system and its dynamics aren’t in balance. Consequently, studies by the National Institute of Health (NIH) reveal that when it comes to addicted family roles there’s potential that more than one individual is experiencing problems with substance abuse. Learning about how families play a part is the progression of substance abuse is the cornerstone for your loved one(s) recovery from addiction. Although the family roles in addiction and unhealthy dynamics contributing to patterns of substance abuse are going to change and depend on the family affected, there are basic roles that many families do take part in. Reaching out for professional help – outside the family norm creates more potential for positive change and recovery. Research shows that substance abuse treatment and family therapy go hand-in-hand and you can effortlessly see why. If someone you love is misusing alcohol, using illicit drugs, or abusing prescription medications, the first thing to do is ask for help. Being open about the issue and accepting guidance can make all the difference. It’s common for families to believe they can solve a loved one’s substance abuse problem without professional help. Even if, from time to time this may be true, many don’t recover without adequate and professional addiction treatment services. You’re not at fault for being unsure of which road to take. There are several reasons why going to rehab and getting your loved one into a treatment program is crucial. Rehab centers offer a host of services from overseeing your loved one’s health status to getting him or her a proper mental health diagnosis. Of course, with these types of services, your loved one will receive the individualized services tailored to meet their actual needs. So, why exactly is getting your loved one help through a rehab center necessary? There are many reasons why a person should begin recovery in rehab. What if They Refuse Treatment? Have you been living with an addicted family member? It’s likely that your patience is little, and you might be at your final straw. You’ve seen the problem for some time now and have offered to help. The compassion, understanding, and patience you once had for your addicted loved one is at its end. If the offers you’ve made your loved one to get him or her professional help only leads to them brushing you off, ignoring or flat out refusal, what should you do? It’s common for families and parents of addicted loved ones to lose hope of the situation getting better. When a loved one refuses to get help for substance abuse, it’s usually because he or she doesn’t believe there’s a real problem. Such cases need the aid of other people, such as friends or extended family members. Asking for help from others who care about your addicted loved one can make a world of difference. Families have a special ability to influence individual members in significant ways – including convincing someone with an addiction to get treatment. In fact –this influence potentially explains why family interventions have a reputation for being effective. An intervention is a structured and carefully planned process that brings together family and friends to confront a loved one with addiction. If carried out correctly, an intervention can motivate a person to accept help for their addiction. Interventions that hold potential for success are properly organized and planned long before the meeting takes place. If your loved one refuses treatment, hiring a professional interventionist -that has training in areas like conflict resolution and motivational techniques may just do the trick. Interventions are something that families tend to try on their own. without considering the benefits of getting help from a trained professional, your efforts may not give the reach you’re looking for. This calls into question – when is the right time to step in? Should we try to intervene at home? Should we hire a professional? First off, let’s talk about what a family intervention is. Family interventions for addiction are a powerful tool in fighting back against a loved one’s addiction. But, why should you have one? There are two main goals for holding an intervention. The first goal is to get your loved one to see that they have a problem with addiction and need help. The second is to get your loved one to accept the help offered and go to treatment. Yes, interventions planned and held by the family unit can work. However, it’s important to keep in mind that without a professional interventionist, the success rate is much lower. Typically, professional interventionists are a fundamental part of a successful intervention. Credentials of an intervention therapist cover topics about what an interventionist is and why you need such a specialist in your corner. If you are thinking about treatment for a loved one in the family, you may be wondering if it’s even an affordable choice. We understand that getting someone help for addiction is challenging. Then having to fathom treatment affordability is another ball game entirely. For this reason, here’s a list of a few options available that’ll help you pay for substance abuse treatment. Federal health insurance programs such as Medicare and Medicaid can help you afford certain portions of your loved one’s drug or alcohol rehabilitation. Although Medicare and Medicaid insurance plans do change according to the state, knowledge of services available under coverage is readily available. When paying for treatment with insurance, most the better half of private insurance companies offer coverage for behavioral health. Because drug and alcohol rehab is under the behavioral health category, most insurance companies will cover the costs of treatment services you receive. The United States Veterans Administration (VA) offers coverage for drug and alcohol treatment for veterans who meet the requirements for eligibility. If your loved one is a veteran and you have a concern about affordability, check out the necessary requirements for coverage of veteran substance abuse treatment programs. There are also avenues to receive Federal funding to get into state drug and alcohol rehab program. Federal and State-funded treatment facilities are a good alternative for those who don’t have private insurance. If you are looking to learn more about this low-cost option, you can go to how to find a state-funded rehab center. For more information on how to locate state-funded treatment facilities, go to Options to affording treatment. If you’re looking to get a loved one into treatment, it’s probable you’re wondering how long does addiction treatment usually last? Treatment options for substance use disorders vary greatly. The type of addiction treatment your loved one commits to will depend on the severity of his or her addiction. Research from the National Institute of Drug Abuse, NIDA indicates that longer-episodes of treatment are associated with more successful recovery outcomes. It’s important to know all options that are available when seeking substance abuse treatment for a loved one. Short-term treatment options are available and last anywhere from one to three months. 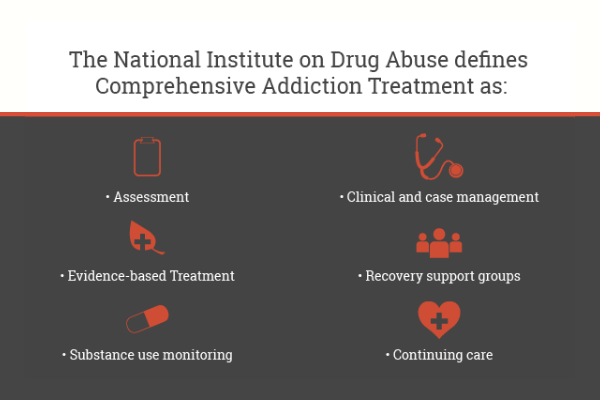 Most common substance abuse treatment program lengths are 28-days, 60-days, and 90-days. The length of time your loved one stays in treatment will determine the number of services he or she receives and the overall effectiveness of the program. Long-term treatment programs typically range from 6 to 12 months. The NIDA considers longer treatment durations as the most effective option. Six to twelve months of time may seem unreasonable, however before you make the judgment, you should know the benefits of long-term treatment and the services available. Since addiction is a complex psychological disorder, treatment is necessary for a full recovery. Understanding the countless options of drug and alcohol rehabilitation can make deciding what treatment is best for your loved one easier. If you’re looking to understand what happens in the background when your loved one is in treatment, there are a few basic components you may want to know. Firstly, when going through admission into treatment, your loved one will go through an intake process. Secondly, after intake, he or she will receive a health assessment. Assessments put into effect the creation of a person’s individual treatment plan. The third most important factor is a medical form of detox. In fact, most people with drug addiction and alcoholism need a safe withdrawal process. However, a safe withdrawal is only done through a medically managed detox. The importance of medical detox is especially true for people with alcoholism. Detoxing from alcohol breaks down the process and different stages an individual’s goes through during alcohol withdrawal. After the stage of detoxification is complete, your loved one will begin his or her inpatient treatment. With family integration, the effectiveness of treatment outcomes increases. Family involvement in comprehensive treatment regimens positively correlates to an increase in engagement of addicted loved. Engagement increases in the areas of willingness for treatment entry, a decline in treatment dropout rates and higher long-lasting outcomes (SAMHSA). In 2016, an estimated 21 million Americans ages 12 or older needed substance abuse treatment, SAMHSA. Treatments for substance abuse and addiction use variations of both pharmacological and behavioral therapeutic approaches. In the U.S., over 14,500 specialized drug and alcohol treatment centers offer different counseling methods, behavioral therapies, proper medication-assistance, individual case management, and other many other services for people with substance and alcohol use disorders. 7.9 million Americans had co-occurring mental and substance use disorders in 2014. Addiction treatment that doesn’t incorporate proper assessment and diagnosis of mental health is not comprehensive. For this reason, it’s important to address and ask about all services offered to ensure adequate and comprehensive care. After treatment is complete, your loved one should have individualized and specific instructions for aftercare. When he or she is released from treatment, community re-integration is crucial to success. Approaching discharge, treatment centers will formulate a plan of action for supporting recovery. Aftercare plans for when a person discharges from a facility aren’t going to be the same for everyone. Each individual discharge plan is to meet the unique needs and desires of your loved one, who’s new in recovery. Aftercare treatment planning is inclusive of all aspects your loved one will need to stay clean and sober. This usually needs a continuation of therapeutic care services. 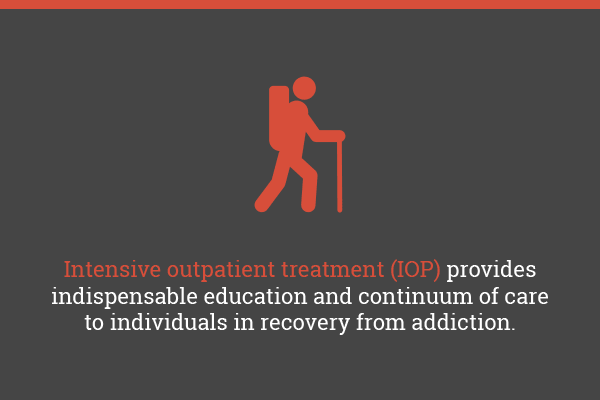 Many who discharge from inpatient treatment commit to an intensive outpatient program, IOP. IOP services are an effective way to foster self-awareness and identify triggers. Learning about relapse prevention and practicing coping skills to use in everyday living is essential for success. Sometimes one of the most important steps a person can take after leaving rehab is the choice of transitional housing. Should our loved ones go straight home or have a subtler transition from rehab to home? There’s a high success rate in recovery from drugs and alcohol when one gradually transitions from rehab to independent living. When a loved one is in treatment, he or she will have to face the decision of where to go once the inpatient treatment part is finished. For example, some end up moving back to their personal residence or in with their parents, but many transitions much slower. A slower transition into everyday living involves a sober living environment. Which brings into question what is sober living? And Should my loved one go to a sober living home after treatment? Before a loved one leaves treatment, it’s encouraged that family members seek out and obtain support from outside sources. After he or she leaves treatment, continuing or beginning family therapy sessions is necessary in most cases. Family therapy for addiction consists of several therapeutic approaches. Therapy methods stem from beliefs about the importance of the family system in recovery. When addiction treatment and family therapy services are joined, the problems, motivations, and needs are increased radically. Different models of family therapy aim to aid healing of family-specific dynamics. If you want to know more about the different types of family therapy, you can go to our page on therapeutic options for families. It’s important to acknowledge that there is a distinct difference between traditional family therapy and therapy that involves family. Setting healthy, yet realistic boundaries for yourself as an impacted family member is important. In other words, creating boundaries with an addicted loved one – in or out of recovery is frustrating but powerful. Of equal importance is knowing what self-care is and how to apply it in your life. It’s known in the recovery community that one is of little help if they don’t help themselves first. Without self-care, families affected by addiction quickly experience distress, resentment, and complete burnout. Learn about the basics of self-care and practice it daily. Being in recovery from addicted and dysfunctional family dynamics is just as much a personal as it’s a family affair. Recovery from addiction in a family needs participation and cooperation from all members. Whether the family member abusing substances is an adult or child, the whole family system must change, not just the person addicted. Families who are involved will find that the focus of treatment isn’t the drinking and drug use alone. Rather, the goal is to address the issues that affect the family system at large. So, what exactly is long-term recovery for non-addicted family members? What does it look like? Long-term recovery is not simply for the addicted member of the family. Recovery from the disease of addiction is a family affair. Continuing treatment in family counseling and therapy fosters healing and a maintainable recovery from substance abuse for the individual addicted as well as the rest of the family. Many who struggle with drug or alcohol addiction turn to 12-step groups to gain lasting recovery. However, what about the family? Where do family members turn to for support and guidance for a loved one’s addiction? The two most popular support groups for individuals directly affected by alcoholism and addiction are Alcoholics Anonymous and Narcotics Anonymous. AA and NA groups are 12-step programs that help people with AUD and SUD to break free from addiction. Per the increasing with substance abuse in society, there are other drug-specific 12-step programs. Substance-specific programs are Cocaine Anonymous, Heroin Anonymous, Crystal-Meth Anonymous, and more. 12-step programs are based on spirituality and offer guidance to a new way of living and thinking. For the loved ones of those with addiction to drugs and alcohol, 12-step groups are also a possibility. For families living with amongst a substance-abusing loved one, active participation in 12-step recovery support groups is crucial. Fortunately, a handful of support groups for families and parents of addicted loved ones are available and accessible. Family support groups that use the 12-step approach are Al-Anon and Nar-Anon. This is the first time I read addiction explained as a disease, and the explanation actually made sense. This comes off as a good guide for someone who has a family member with an addiction problem, and needs to have a better understanding of the situation. The seeing the family roles really affected me because I can see how neatly my family members fall into them and how some people are more than one, constantly trying to bring the family back together and distract from the real issues. Thanks for bringing attention to these incredibly important issues. Thanks, Dr. Michael Carlton for sharing knowledge with us. I have seen where most families never thought it wise to take care of addicted loved ones because they feel it’s beyond their power and even not their duty. No doubt, the rehab center is often the last resort, complementing the effort of the family. But apart from the rehab center, I feel that handling addiction of loved ones first in the home shouldn’t be written off. The families should try as much as possible to intervene and deal with this issue squarely and never to shy away from it. Although it’s not always an easy task, this guide/article is an eye-opener to families with like-issue, so that they can effectively and efficiently manage addiction by bringing closer of loved ones, observing their actions and then acting by giving all the support and love required to treat this chronic disease before the intervention of professionals/rehab Center. Addressing addiction as family is important because not only does it provide support but also because addiction is genetic and creating a family support system is a way to prove to your family that you are there for them and realize that they too are struggling. What drugs are physically addictive?